Season each cutlet with salt and pepper. Top each with 1 slice prosciutto and 2 sage leaves. Place chicken cutlets between 2 sheets of parchment or waxed paper. 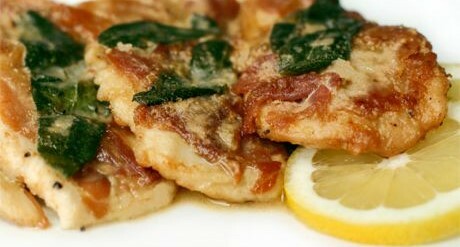 With a mallet or rolling pin, gently pound cutlets to an even 1/4-inch thickness, pounding the prosciutto and sage into the chicken. Spread flour on a shallow plate and dip the chicken in it, lightly coating both sides. Heat 1 tablespoon of the butter and the oil in a large skillet over mdium heat. When butter begins to foam, add cutlets to the pan, prosciutto side down. Cook 3 to 4 minutes per side, turning once, until lightly browned and cooked through. Transfer to a platter and cover to keep warm. Add wine to the hot skillet and stir with a wooden spoon to loosen all the brown bits from the bottom of the pan. Let wine reduce by half, then add broth and reduce again. Remove the pan from the heat and swirl in remaining butter. Pour sauce over the reserved chicken cutlets. Serve immediately with lemon wedges.